The latest driver release contains support for Call of Duty: Black Ops 4 along with Windows 10 October 2018 update and stability improvements. Using the 18.10.1 version, the Radeon RX Vega 64 8GB graphics gets 5% faster performance on Call of Duty: Black Ops 4 at 1080p than version 18.9.3. 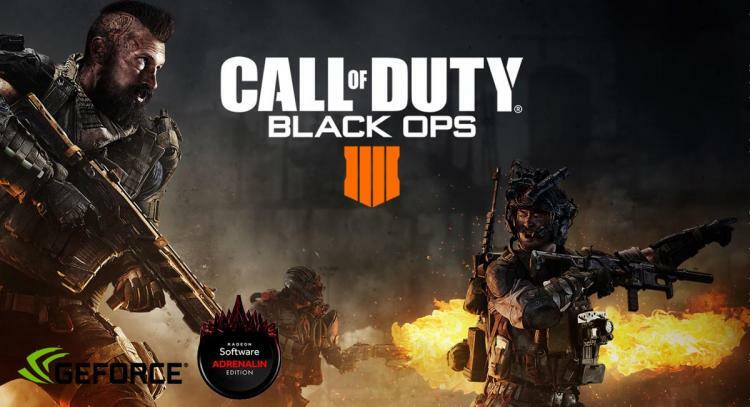 The Radeon RX 580 8GB graphics cards get 5% faster performance on Call of Duty: Black Ops 4 at 1080p that version 18.9.3. The latest driver version also fixed known issues and added Vulkan Extension Support. Read the Radeon Software Adrenalin Edition 18.10.1 release notes here. NVIDIA also releases its latest Game Ready Drivers that aims to deliver the best possible gaming experience on GeForce graphics cards. The Game Ready Driver 416.64 WHQL offers game stability and performance improvements for Call of Duty: Black Ops 4, SOULCALIBUR VI and GRIP. It also fixed a few known issues and added application SLI profiles on several games including Battlefield V. The new driver also added new 3D Vision Profiles for Elder Scrolls: Online. Read the GeForce Game Ready Driver 416.64 WHQL release notes here.